Thursday, August 7. Submissive and doj will leave hamburg at 11.30 and nothing is prepared yet. During the previous days they have been very busy on copy 'n pasting their latest (and lamest) demo called retro. As every good release for a party it is not finished yet. The keyframing does not work and the demo is not linked yet. So they will have to spent some more hours in their editors after arriving in Helsinki. 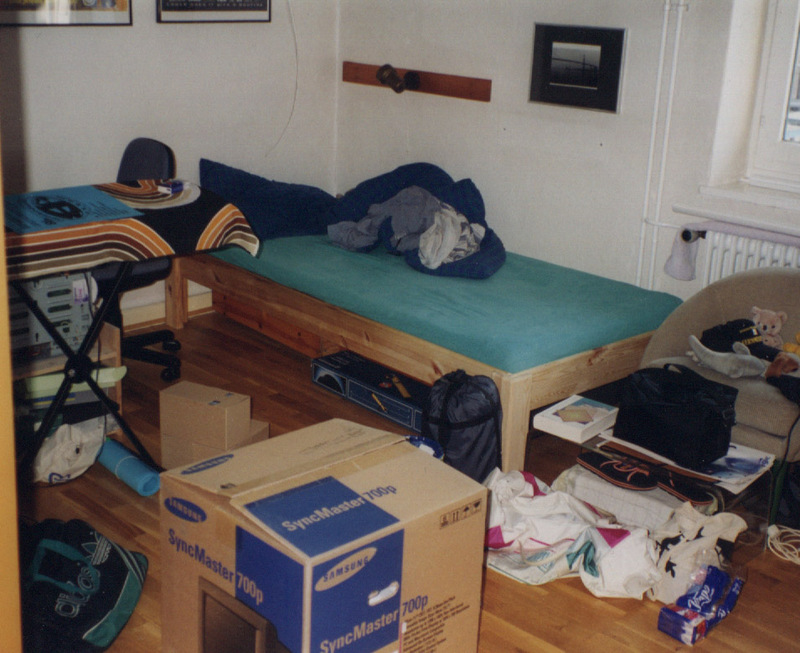 The picture on the left shows doj's room after he started to pack things for the journey. His brand new 17" Monitor is already stored in its box. The rest of the equipment is waiting for beeing packaged. Meanwhile Submissive is ripping of his big tower and trying to install his equipment in an old desktop case. But it turns out that the desktop case is too old and the mainboard won't fit. Transporting the big tower trough plane is no alternative either, so he decides to take all stuff seperately to finnland and buy a new case. 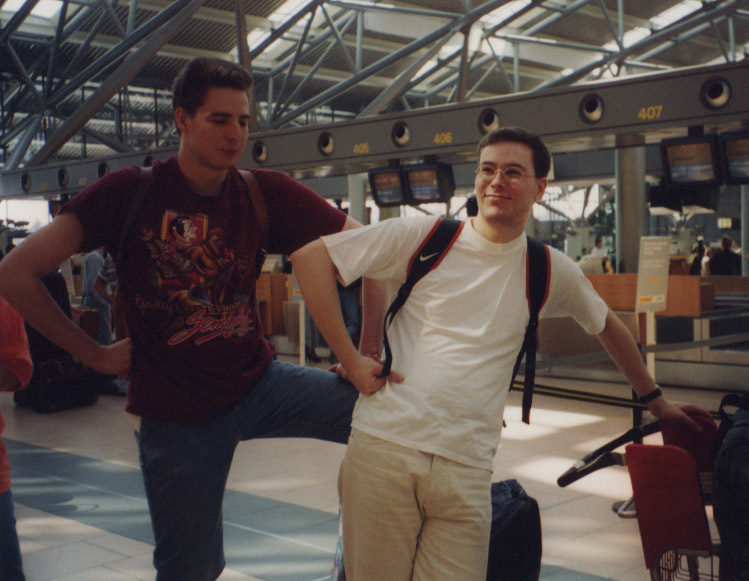 1) submissive is the taller one wearing a violett shirt combined with blue jeans. 2) doj can be spotted by his golden glasses and white shirts together with light trousers. Experienced flight men know that you always have to make a certain procedure called check-in before take off. Beautiful women called stewardesses sit in long rows at the airport and ask you questions like "smoking or non-smoking" and you have to put your baggage on a conveying belt where it will disappear. Your baggage. The airports do not take into account that sceeners want to take stuff like monitors with them etc. Well submissive's monitor was an old 14" and fitted perfectly into the belt while mine was some cm too large. So I had to take it directly to the plane. Suddenly the airport people thought that a bomb could be placed inside the monitor and they started making various test for explosives. Of course they did not find any, but I learned that terrorists should place their TNT inside 14" monitors, cause these will be not checked in Hamburg. Anyway on our flight back from Helsinki no one was interested in explosives etc. People just accepted our luggage as it was. But the finns take some closer look at weight and we had to pay some good amount to get our stuff delivered. So if you plan to take some gold or uran with you be sure to lift off from Hamburg, cause our Lufthansa stewardesses are too dumb to recognize the difference between 50kg and 80kg.